Decorating the interior of your home is one of those activities that can be exciting, expensive and stressful. There are usually cost restrictions requiring compromises, checking colour swatches against paint samples, cruising the internet for ideas and finally, the decisions that you hope will deliver the result you want. Wood or Plastic – Which One is Best? Window treatments are one of the areas where costs can be reduced depending on the materials used, and two of the most common materials used in window blinds are wood and plastic. Fortunately, choosing one over the other is not necessary as both can be used, depending on the location of the windows. Wood blinds, whether natural or painted, add a degree of warmth and elegance to a room. Timber venetians are an excellent choice for a bedroom, especially when you are trying to find a balance between blocking out harsh sunlight, maintaining privacy and having a blind that is light, and easy to raise and lower quickly. They can be oiled, stained or painted to suit any décor and are available in a wide cost band for every budget. Timber is also a great choice for lounge areas, from plantation shutters that sit inside the window frame to traditional venetians, but this is one is those locations where plastic can have just as big an impact. It really depends on the budget and the style effect you are creating. 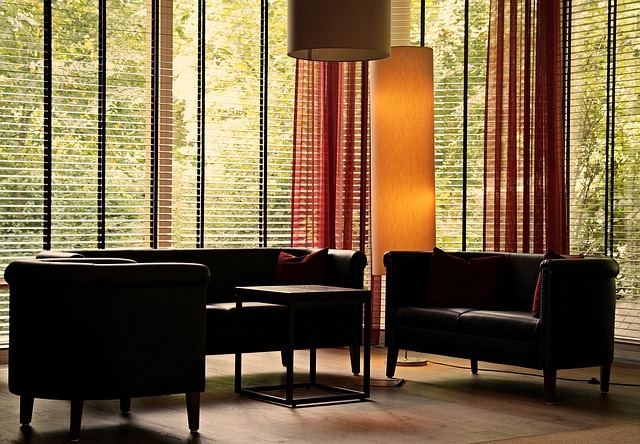 Plastic venetians come in a wide range of slat styles and colours, so they are also suitable for lounge areas, and can be every bit as elegant as timber. The advantage plastic has over timber for blinds is that it can be used in the wet areas of the house. Steam and moisture can cause timber slats to warp and swell, so plastic is the perfect substitute. Think for a moment about the amount of times in the kitchen, for example, that the walls and windows are exposed to heat, steam and moisture. It is a similar story in the bathroom which is the room in the house that is most susceptible to damage from heat and moisture. Plastic will last the longest and keep looking good in this type of environment. If you are struggling to meet the budget for your home renovation, there is another alternative to new blinds. Here at Blind Concepts we clean, repair and refurbish your original blinds at a fraction of the cost of replacement. Whether they are timber or plastic, we can have them cleaned and back to you in 24 hours. This means more cash for you to spend on the rest of the house. Getting the right window dressings to suit the architectural style of a room is the final touch that brings all the elements of the space together. There is an amazing range of window dressing materials to choose from, both natural and synthetic. Surprisingly, given this multitude of choices, wood blinds are still very popular. Is the Enduring Popularity of Wood Blinds a Yearning for Nature? Is it because people living in modern cities are disconnected from nature to an extent not seen before? Are we subconsciously desiring to bring some of that nature back into our lives by choosing timber over aluminium or composite materials? Whatever the reason, shutters and blinds made from western red cedar and other timbers are still in demand, and bring a warmth and sense of comfort to any room. We work with timber all the time at Blind Concepts so we know its desirable qualities. We do offer some words of caution, though, as there are pros and cons to using wood blinds. There is nothing that cannot be worked around provided you are aware, so we offer some comments here to help with your decision making. On the negative side, some wood blinds can be heavy, placing additional stress on the cords and control mechanisms so they break more frequently. As a natural resource, wood has variations in grain and colour so if you are looking for consistency, it may not be the best choice. Also, some timbers warp and crack with changes in moisture, making them unsuitable for wet areas. The positive features of wood blinds are many. They immediately give warmth and character to an otherwise boring room, creating an illusion of permanence and stability. This negates the need for other work, saving time and money. Decorators need not settle for natural wood colours if they are seeking a contemporary look. Wood blinds come in all colours and finishes, from matt to high gloss and everything in-between. A big feature is the flexibility that timber venetians offer the occupants. They are fully adjustable to allow in just the right amount of light and air, can be closed completely against inclement weather or cold, or raised up to expose a full view of the outside. All these adjustments are quick and easy, and are done from the inside of the room. The best part about wood blinds is that they can be professionally cleaned and repaired. Our people are experienced at cleaning, repairing and restoring wood blinds. We will pick them up from your home and return them to you in no time, looking like brand new blinds. Regardless of how well they are made, or how carefully we have maintained them, the time will come when our window blinds need to be replaced. Like a comfortable pair of shoes, however, some home owners keep them in service longer than they should, spoiling the exterior appearance of their home, and exposing their carpets and furnishings to sunlight. There are plenty of warning signs that your blinds have given their all and need to be retired. These signs will vary depending on the style of window covering you have, so we have assembled a selection for you to check against your existing blinds. In timber blinds, heat and humidity over many years can cause some or all of the slats to warp. This looks unsightly, makes the blinds very difficult to keep clean and where more than one or two slats are affected, will prevent smooth movement when raising and lowering. Aluminium slats can withstand some rough treatment, but when they become completely bent out of shape, they also need to be replaced. Even blinds with some level of UV protection will eventually fade if constantly exposed to the sun. However, if your slats have become yellow or discoloured beyond what you would consider normal fading, the materials they are made of have deteriorated to the stage where the structural integrity is compromised. They are now a safety hazard. You should not have to use excessive force to raise or lower your blinds. If that is happening regularly, the mechanism controlling the up and down movement could be on the verge of breaking altogether. A sudden jerk to get them moving risks bringing the entire set crashing down, which could cause damage or personal injury. They should be replaced as a matter of urgency. It is a similar story with the tilt wand. Repeated twisting to manipulate the slats will eventually wear out the tilt mechanism. Check first if it can be repaired easily, but if it is too difficult, again, replace the blinds. Do Your Fabric Blinds Have Frayed Edges? The answer to this problem is quite simple. This type of wear happens when the edges scrape along the window frame, which would have been caused by incorrect measurements taken when the blinds were first installed, or the installed blinds are made with a cheaper, low grade budget fabric. The fabric and/or tight fit will continue to fray so it is probably time to get correct measurements and new blinds. Even though you may have decided by now to buy new blinds, this does not mean that the old ones are only good for landfill. At Blind Concepts we are experts at re-purposing tired blinds by restoring or replacing them. As the saying goes, “one person’s trash is another person’s treasure.” Call us for a quote and we will find the best solution for you. A recent international survey identified Australia as the country with the largest homes in the world, measured in terms of floor space per capita. This makes sense when you think about the size of the typical project home built over the past 20 years. Most had four bedrooms and a study, a rumpus or family room, separate formal dining, outdoor patio and double garage, even though the average family was just three people. Times have changed, and with that has come the rise in popularity of inner-city apartment living. Because the move to be closer to the city comes with a hefty price tag, many buyers have realised that they can no longer afford a large dwelling. While they have settled for smaller rooms, they are still looking for ways to create the illusion of space. At Blind Concepts we can suggest an old trick for windows that will make a small window look larger and will not cost the earth. Typically, when we measure a window for a customer, we supply a blind that will fit neatly into the window recess. This defines the size of the window, immediately highlighting the boundaries of the frame. To make the window appear larger, we can raise the height of the blind and also increase the width, so that the blind and any curtains the customer decides to hang later, sit much further outside the window frame. The mind assumes that the window behind the blinds and curtains is the same size as they are, tricking us into thinking the window is much bigger than it is. Alternatively, where the blinds are installed into the cavity or recess of the window, this creates more external space as the they are not taking up the space of the walls. This also creates the illusion of a larger room. As far as room sizes go, there are a number of different ways that smaller rooms can be made to appear larger. One of the easiest and most cost effective is to use mirrors to reflect light and bounce images around the walls. Either individual mirrors, or mirrors that go from floor to ceiling will create the illusion of a more spacious room. Furniture on Legs – Who Would Have Thought? Keep furniture light and go for pieces that are raised on legs, rather than sitting directly on the floor. The spaces underneath can then be seen, extending the eye back much further than if the pieces were solid. This can make a surprising difference to your perception of size. Use solid, continuous flooring in small spaces. Breaking up an open-plan area by having one type of flooring for one section, and something different for another will make the space look smaller. Avoid rugs or patterned carpets and research the paint colours that will add size to all your rooms. Keep rooms uncluttered and tidy, and you will find it easy to fool the eye. One of the biggest concerns for people when they order blinds is that these blinds will have to be installed. For those of us that are all thumbs when it comes to DIY, this can be a somewhat daunting prospect. You need not be too concerned, however, the installation of blinds is fairly simple but if you do not feel up to the task, you can always get someone in to install the blinds for you. Any reputable blinds installation company in Brisbane will do but it is best to check with the people that you bought the blinds from in the first place. If they do not offer an installation service themselves, the chances are good that they will be able to provide you with a reference to someone that could do a great job. If you decide that you want to give it a try yourself, there are some basic rules to follow – if you are willing to go along carefully and put the effort in, you will find it easy to install the blinds yourself. The first step is to assemble the blinds and measure the distance between the brackets. Put one of the brackets in place and make sure that the bracket is as straight as you can possibly get it. Mark in pencil on the wall where exactly the screws need to go. Measure across where the other bracket needs to go and mark this in the same way. The next step is to use a spirit level to make sure that the two marks are level with one another. If your blinds are uneven, they will not be able to hang correctly. If the blinds are very long or very heavy, it is advisable to install a third bracket in the middle of the window in the same manner as before. You will now drill the holes in accordance with the pencil marks and screw the brackets into place. You will then slip the blinds onto the brackets and then close the brackets over them to secure them in place. You will repeat this process for all windows in the room and your blinds in Brisbane will be installed. As you can see, whether you decide to install your blinds yourself, or you decide to get someone in to do it for you, you will find that blinds are really quick and easy to install. It is likely to be quicker to install blinds than it is to hang curtains. Christmas, as always is a time for togetherness and family – a time spent relaxing around the home with your family. Because it is also in the middle of summer, we want to be able to sit outside with our family and guests and catch a breeze to cool down. If it’s possible for our guests to be able to see into our windows, we don’t want them to see that our bed is not made or something else is not tidy, but sometimes this can’t be avoided as some mums have eagle eyes and no qualms about peering though windows! To avoid a disapproving glare from mummy dearest, fitting some privacy blinds on your windows is a good idea. Should anyone want to know why your blinds are down during the day, simply tell them that you are showing them off. Blinds Installation in Brisbane is simple to arrange – ask for professional advice – you may even be able to install them yourself. There is not too much labour involved as in many cases, a person just needs to mark the target areas to make sure that the blind hangs straight and then drilling the relevant holes. Screw the blinds in and retire to enjoy a fresh, cold beer. Or, if that doesn’t appeal to you, call in a blinds installation specialist. Just make sure that you get it done quickly – it’s nearly time for that big family get together and mum’s disapproving stare. All joking aside, blinds can provide protection from more than just curious stares. They also provide much needed protection against the sun. We all know just how bad the Aussie sun can be in summer and so you really need to consider ways to protect your home from it. At the end of the day, curtains simply do not provide the same level of cover without being bulky and unwieldy. The main disadvantage of blinds in Brisbane is that they come in such a range of styles and colours that you may have trouble deciding which blinds to get. Before setting out on a shopping trip or trawling the internet, it is wise to consider exactly what you are looking for in terms of blinds. Do you want something that blacks out all light or would you rather have something that is a little more translucent? Do you want fabric blinds, metal blinds or wooden blinds? What colour are you looking for? Once you have answered all of these questions, it is time to measure your windows. If you have windows that are not a standard shape, you are going to have to consider getting custom blinds. Once you have all this info in hand, the time to look for your blinds has arrived. Enjoy.